Over the weekend, I started seeing a certain hashtag come up in my Twitter feed, then I noticed it on Instagram. 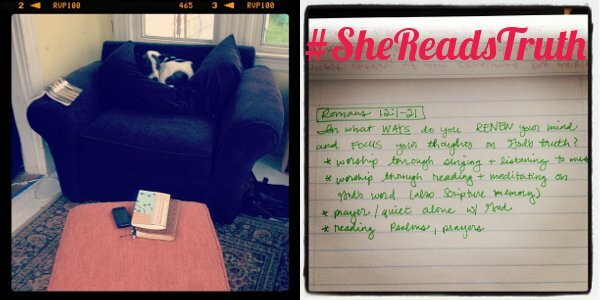 It was #SheReadsTruth and after reading some tweets I realized it was a Bible study of sorts. Thanks to Hayley, I learned it started out of YouVersion's Soul Detox reading plan. The idea is to do the 35 day Bible study and share what you're learning through social media ((primarily Twitter and Instagram)) and it was started by Maggie and Kacia last week. I loved the idea when I learned about it from Hayley's post and as I dug into the Word to see what it was all about, I loved it even more. The content is beautiful with the idea of a soul detox. Why not? We talk about doing a cleanse of our body and eating healthy. This is health food for the soul. It's short and simple enough to get the devotional done daily. So far, the devotionals are one or two passages of Scripture then followed by one or two questions. And from the sound of so many women sharing, it's just what we've been aching for. It got me thinking about why I am so encouraged by this movement. I think it comes down to two things: community and commitment. One of the biggest benefits of the blog world for me is the sense of community I feel from networking with so many women from all walks of life and most of whom I have never even met. Yet, I feel a strong sense of connectedness to these people whose blogs I read daily. 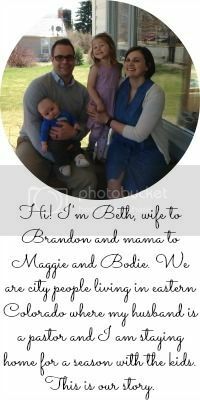 In several cases, I can tell you their children and/or spouse's names, what they ate for dinner last night and what they are likely to be doing at 9am ((some of this I learn through their blog, but also from following them on Twitter and Instagram)). And when it comes to commitment, I admit I'm terrible about finishing things like books or devotionals/Bible reading plans. I have great intentions and get excited to start something new. But it often quickly wanes and other things fill my time. So, by combining a community I feel connected to and invested in, with a somewhat public commitment I am hopeful I can finish this 35 day devotional study. I am excited to be encouraged by other participating and sharing their insights. I am anxious to see what I will learn and how it will increase my faith. I can't wait to see what's next. Want to join in? Today is Day 6 ((I caught up quickly on all 5 days yesterday)). I know. I'm so encouraged by this accountability and by other women wanting to dig deeper and grow in His truths especially in the public's eye. So blessed and happy you're doing it. YOU SO WILL FINISH, we'll hold you to it! This sounds like a great devotional! I love the sense of community and connectedness too! !